All other green campaigns become futile without tackling the economic system and its ideological defenders. Economics is only dismal because there are not enough of us making it our own. Read on and become empowered! For my generation the car represents freedom and I am struggling to evolve. I spent an exhausting six weeks without my car some years ago. It meant a lot of cycling in the rain and a greatly reduced social life, since I live in rural Gloucestershire where there are no buses after 6pm or on a Sunday. Now I spend some of my life in London and my daughter has left home I am inspired to try again. The difficulty of overcoming the indication is made clear by the fact that, since my car broke down more than a month ago, it has been sitting on my drive. I will not get it mended but I cannot give it up. How cheering it was, then, to find a short film that indicates how little younger generations are attached to the car. This emerged from some teaching I did at Masaryk University in Brno. The students were asked to make a film about any aspect of 'green economics' and one group chose reducing their carbon footprint. 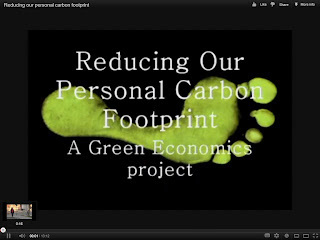 The university is internationally focused and so they were able to interview students from across the world, asking them which of a number of energy-balanced aspects of their lifestyle they would sacrifice to reduce their carbon footprint. Of course this film was made in Brno, where the trams are a delight and the transport system is integrated in terms of timetables and ticketing. And these young people do not yet have children and are still for the most part energetic and healthy. But what cheers me most is that for people of this generation the car is no longer a symbol of freedom or a source of glamour. As a recent episode of Costing the Earth reported, young people no longer find psychological satisfaction in car ownership in the way we did: bikes and buses are cooler than a shiny set of wheels. Cars do seem to help maintain that illusion of personal freedom and a sense of invulnerability. Hard to get past the idea that you can just pick up and go - cruise on the open road to someplace possibly more desirable than where you are now (until the reality of the next traffic jam sets in). And having that invincible steel and glass exoskeleton surrounding you is surely better than puny flesh and bone? Until you have a serious accident, and find out that most insurance systems are adversarial when the time comes for coverage to kick in. 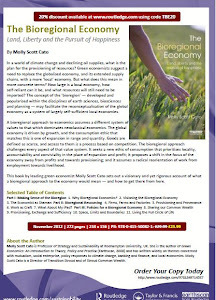 I have negotiated a 20% discount on my book The Bioregional Economy which you can claim by using the flyer that is attached here. I must apologise for the quite outrageous price that Taylor & Francis are charging. I signed a contract with Earthscan but was sold, as a slave and with all my chattels, and have no control over this. After considerable negotiation they have agreed this discount so please make use of it. How Big is your Green Stimulus? Growth or Balance? Cowboy or Spaceman? One Tonners, serious carbon cutters!